This is a one of a set of essays tracing peoples with a specific paleo-European kinship from their origins in Africa ~70ka to their destination in England in the current era. This, the earliest chapter, explores the period from 70ka to 25ka. For motivation, technical background, and links to all chapters, refer to the Preface. Hominids had been leaving Africa for Eurasia for nearly two million years, beginning with Homo erectus and later Homo neandertalensis and Homo denisova. And Homo sapiens appears to have made an early attempt around 80-90ka. But all these previous adventure attempts are thought to have been extinguished. Neandertal and Denisovan DNA has recently been sequenced, telling us how closely they were related to each other and to humans. As shown in the following diagram, Denisovans and Neandertals are cousins whose lineages diverged from each other over 600ka. Their common ancestral lineage diverged from the Homo sapiens lineage over 800ka. All non-Africans are speculated to contain about 4% neandertalensis DNA. Some Australasians have up to 6% denisova DNA. Various theories attempt to account for these archaic background genetic signals. 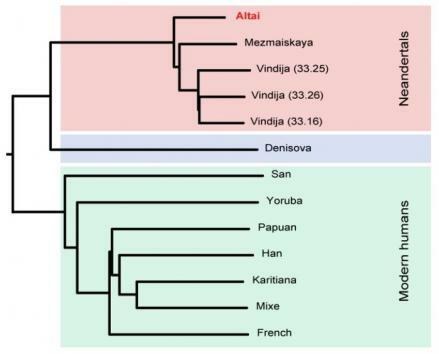 Interbreeding with Denisovans in SE Asia, along the leading wave of human migration from Africa, seems the most parsimonious explanation for that signal. The ubiquity of the Neandertal signal in all non-African humans makes the source of that signal still open to speculation. The non-recombinant Y-chromosome (NRY) SNP, CT-M168, defines the progenitor of all the human male lines that established themselves outside of Africa. From the CT-M168 people of 70ka, there evolved two NRY sister clades, CF-P143 and DE-YAP (YAP is a non-standard polymorphism caused by inclusion in the Y-chromosome of some foreign DNA). The non-recombinant mitochondrial (mtDNA) SNP, L3, defines the progenitor of all the human female lines that established themselves outside of Africa. From the L3 people of 70ka, there evolved two mtDNA sister clades, M and N.
In this chapter, we will follow male NRY genetic vectors CF-P143 -> F-M89 -> IJK-M522 -> IJ-M429 -> I-M170, and female mtDNA vectors L3->N->R->U->U5. These parallel pathways cover more than 50,000 years, tracing the tracks of anatomically modern humans (AMH) from the Horn of Africa to most of the rest of the world. We will gradually focus on one narrow slice of that great population exodus and bloom. Haplogroups I-M170 and U5, together with their parent clades, are thought to have formed the core of the earliest human population of Europe. A few sister clade members (e.g. NRY C and mtDNA M) also appear to have hitched a ride to Europe, at least until the LGM. Two recent papers inform our understanding of AMH advances outside Africa. Karafet et al. (2008) provides a chronology of NRY DNA genetic events prior to the LGM. One assumption is that NRY CT-M168 first appeared in northeast Africa before 70ka. Soares et al. (2010) provides a second up-to-date chronology, this based on mtDNA. This paper places AMH migration from Africa to the southern Arabian peninsula beginning ~70ka. The AMH migration referenced in the papers above is the first to maintain full DNA continuity with the world’s present populations. These two cited scenarios of AMH out-of-Africa migration, the NRY and mtDNA hypotheses, seem synchronous, which is good since boys and girls usually wander around together. Both papers posit a burst event more than 60ka, when a group of AMH left the horn of Africa for the South Asian coastal lands. Mitochondrial DNA Haplogroup R appears to date from ~67ka and thus seems a candidate for this initial migration wave into South Asia, along with NRY DNA haplogroup CF-P143, dated to ~69ka. 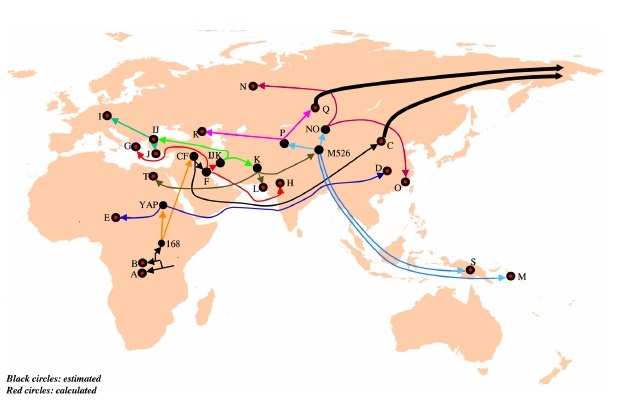 Portions of the two M168+ NRY sister clades, DE-YAP and CF-P143, together with mtDNA sister clades M and N, left Africa together and populated the rest of the world. The males subsequently resolved into NRY haplogroups C, D, E, and F. All subsequent peoples born outside Africa are one of the Y-DNA haplogroups C, D, E, or F, and one of the mtDNA haplogroups M or N. Mostly in the following, we follow the male NRY lineage vectors, with implicit understanding that the corresponding female clades were there as well. The F and N peoples are the subject of this earliest chapter of our Euro-centric story. In the large picture, NRY C, D, E, and mtDNA M peoples are not significant to our paleolithic Euro-centric story. Since they are a part of the early out-of-Africa migration story, a short summary of their early history is provided as an end note. Note the C and M peoples may also have contributed a small part of the Euro-centric story prior to the LGM, per recent paleogenomic results. The forward wave of NRY CF-P143 migration became host to NRY haplogroup C-M130 ~60ka, likely somewhere along the coast of the Indian Ocean, with the Indus Valley being a potential homeland. Wherever this occurred, the majority of the new C-clade continued south along the coast of India. Perhaps others in the CF-P143 population remained there a while longer, allowing NRY haplogroup F-M89 and mtDNA haplogroup U to arise within this population and later NRY haplogroup H as well. Portions of Y-DNA Haplogroup C and mtDNA Haplogroup M also likely included in this residual population. When and where NRY haplogroup F-M89 arose is still only vague conjecture. Looking at the current distribution of NRY F-M89 peoples, northwest India would seem a logical homeland. A substantial population of an F-M89 subclade is to be found in the hunter-gatherer populations of mountainous Yunnan province of China. Other ancient subclades are spread across India. Some appear in the aboriginal populations of Australia, and there are other outliers. Thus, some F-M89 peoples appear to have followed the C-M130 forward wave into SE Asia. Alternatively, the Indus-Gangetic Plain across northern India, shown in green on the map below, extended by the Brahmaputra River valley to the northeast, would have provided a direct route for other F-M89 sub-groups to have reached China, perhaps following the route of the earlier NRY Haplogroup D peoples who reached Tibet. Combining both these scenarios provides some corroboration for the Indus Valley to have been the F-M89 homeland 55ka or earlier, allowing expansion to the S, E, and NW. By ~55ka, the climate had been warming for a few millennia and a part of F-M89 expanded northward from their homeland in northwest India, destination Europe. Our story will follow this F-M89 population, together with the mtDNA U5 clade, likely along the Persian Gulf to the Iranian Plateau. Major Eurasian subclades of F-M89 are thought to have emanated from northern Iran; the one we follow below went directly to Europe. See the end note for NRY Haplogroup R, another subgroup of F-M89 that came to Europe much later, by the back door. Note that although we follow specific Y-DNA haplogroups in their migration, the populations containing them were far from homogeneous. Thus, at this early date, wherever Y-DNA Haplogroup F is thought to reside, there would also likely be haplogroups C and CF peoples as well, and perhaps even CT peoples. And there were likely both mtDNA Haplogroups M and N present. There were likely many other now extinct haplogroups as well. In confirmation, we now have paleogenomic evidence of Y-DNA Haplogroup C from La Braña-1 (Spain; Epi-Paleolithic)) and Kostenki-14 (Siberia; Upper Paleolithic). On the mtDNA side, Haplogroup M, primarily associated with NRY Haplogroup C in Asia, has been found in NW Europe, dating to before the LGM. This goes a ways to confirm that Upper Paleolithic Europe was a heterogeneous mix of several DNA haplogroups whose ancestors migrated from Africa. The following diagram (from Y-Chromosome Diversity, Human Expansion, Drift, and Cultural Evolution; Chiaroni, Underhill, Cavalli-Sforza; 2009) shows the NRY haplogroups that descend from hypothetical Adam, geographically plotted as an expanding network, with nodes to indicate each haplogroup’s putative area of coalescence. The YAP+ and CF people were the principal emigrating haplogroups. Note that the straight yellow arrow on the diagram, plotting the migration of the CF-P143, has little evidence; the more probable route parallels the blue arrow for NRY haplogroup D as far as India, then branches out into the C-M130 and F-M89 population migrations. A hypothetical homeland for NRY F-M89 was discussed above and perhaps is near the location marked for NRY haplogroup H; the red line would then point in the reverse direction to take haplogroup F-M89 back to the middle east. See the End Note for a path of CF-P143 and C-M130 that is more supported by current evidence. Only in the last 10ky, the Holocene, have temperatures and climate stability even resembled today’s. Only in this short interstadial time have humans experienced the cultural advances, change to sedentism, the great agricultural revolution, the rise of the great ancient civilizations. Yet even the minor climate fluctuations in this period are thought to have strongly contributed to ending great civilizations, the Old Kingdom of Egypt, the Roman Empire, American cultures including the Maya and the mesa peoples of the U.S. Southwest. The 60ky prior to the Holocene have seen the Earth in its normal recent geologic-scale state, a continual ice age with temperatures highly irregular but consistently bounded. Today, the global mean temperature is ~14.5◦C; the surface sea temperature (SST) of the equatorial west Pacific is ~29◦C. During the coldest part of the last glacial stage, the last glacial maximum (LGM), the mean global temperature is estimated as ~9◦C, with comparable SST at ~26◦C. Temperature variation increases with latitude, a condition called polar amplification. Temperature is globally coupled, but also dependent on local parameters. Thus it is difficult to estimate the paleolithic climate at a given place and time. Shakun & Carlson (2010) correlate a number of climate proxies to derive a map of likely temperature regimes at various locations during the LGM. Concerning the locations of this storyline, the Middle East may have been ~7K colder and the European periglacial tundra could have been ~10K colder. The shape of the northern hemisphere temperature curve over the last glacial stage is further supported by arctic ice cores and sea bed cores. Oxygen isotope data, the 18O/16O ratio, is the principal climate proxy. Using the shape of this curve, but restricting amplitude as above for the latitude range in which we are interested, one finds the last glacial stage for our part of the globe likely experienced mean temperatures averaging ~5K colder than today, and with periodic cycles ranging from -2K to -10K compared to today. To help place our ancestor’s travels through climate space, it is helpful to assign familiar words to the temperature variability they faced. Using the latest NGRIP data set (North Greenland Ice Core Project with 20 year resolution), together with a simple linear δ18O->δK conversion offset for our latitude range, one can visualize our 10K temperature band of this period as four very approximate 2.5K temperature ranges: WARM (present Holocene), TEMPERATE, COOL, COLD. These data allow us to assign such labels to each 20 year period over 120ky. Such labels are imprecise, but not out of proportion to the uncertainty in the chronology of the underlying data. At gross resolution, Earth’s climate in this period has consisted of five oxygen isotope regimes called Marine Isotope Stages: MIS-1 (WARM), the current interstadial corresponding to the Holocene; MIS-2 (mostly COLD), the LGM 12ka-25ka; MIS-3 (COOL and COLD): the AMH migrations out of Africa, 25ka-60ka; MIS-4 (mostly COLD): a sudden temperature dip, 60ka-72ka; MIS-5 (TEMPERATE to WARM): the period in which AMH developed much of his cultural advancement in Africa, 72ka-128ka. The predominantly COOL and COLD period from ~75ka to 12ka, MIS-2, 3, and 4, corresponds to the last glacial stage. In North America, it is called the Wisconsinan glaciation (Cordilleran ice sheet in the northwest, Laurentide ice sheet in eastern and central regions). In Europe, it is called the Weichselian glaciation over Scandinavia and the Würm glaciation over the Alps. MIS-3 is a long ~40ky period with an average temperature on the low side of COOL. It is bracketed by two deep COLD periods of similar ~13ky duration, MIS-2 and MIS-4, the periods when glaciation maximized and sea levels minimized. COLD periods lock up significant water in continental ice sheets, causing sea levels to drop. The COLD MIS-4 was hypothetically helpful to AMH, with sea level change of -75m facilitating migration routes from Africa to Eurasia. Similarly, the COLD MIS-2 sea level change reached -120m at the peak of the LGM, enabling population of the Americas by AMH over the Beringia land bridge. This chapter is concerned with human settlement of Eurasia, the MIS-3 period. During MIS-3, there were over 20 sudden (decades long) northern hemisphere warming events, called Dansgaard/Oeschger (D-O) events, that raised temperatures off the lows into the TEMPERATE to WARM range, only to gradually descend to COLD again in another 1-3ky. Those Eurasian survivors of the MIS-3 climate challenges were given an even more stern test during the subsequent MIS-2 temperature crunch. Several genetic lineages went extinct as populations were driven out of Europe north of the Alps. During all but the brief D-O events, the MIS-3 climate of Europe north of the Alps was tundra in the periglacial areas and arctic steppe below, similar to northern Canada and Siberia today. Based on agriculture in Canada today, it has been estimated that such a future climate period in Europe would only enable feeding 5% of today’s European population. The coldest periods, MIS-2 and MIS-4, were harsher, pushing the tundra south by more than 10° latitude, from 60°N down to below 50°N in Europe and to below 40°N in mid-North America. Sea levels at the start of MIS-3 were around -70m from present. At the end of MIS-3, they are estimated to have been -100m from present. During MIS-3’s D-O events, sea levels rose significantly, 20-30 meters per episode by various estimates. During colder periods of MIS-3, the climate became more arid, and in turn more moist on the rebound to warmer temperatures. Although a temperature range of 10K seems well-behaved, anyone who studies the effects on flora and fauna of such a temperature changeability cannot help but realize we skate on perilously thin ice as a civilization and a species. Flora and fauna species were in near constant movement, a sort of dance with climate being the caller. AMH had to dance to the same tunes, as had his more primitive homo ancestors for over two million years. Adaptability was an evolutionary trait by which all surviving species were selected, and this cyclic selection force may have accelerated human evolutionary advances outside of Africa. AMH populations survived in Eurasia during MIS-3 because of their ingenuity, their adaptability, their nomadic mobility, and their very low population density, <<1 person per square kilometer. The last glacial stage began with a sudden cooling around 78ka. After a couple of cold snaps of 1.4ky and 2.3ky, the big freeze set in around 71ka and lasted for over 13ky until 58ka. The sea levels plunged 100m during this chill. This would have greatly narrowed the Bab-el-Mandeb strait between present day Eritrea and Yemen, allowing AMH to easily depart the Horn of Africa in boats or rafts for the Arabian Peninsula sometime prior to 60ka. The Arabian Peninsula coast was cool and dry during this cold interval, but fishermen could have lived along the coast. The Haplogroup CF peoples would have had little difficulty moving on to southeast Asia. The Persian gulf was only a river delta during the low sea levels of the period, permitting simple passage from the Arabian Peninsula to the south Asia coast across the delta near the current Strait of Hormuz. The warming trend that began around 58ka, combined with increased rainfall, would have facilitated a migration of the coastal dwellers north along the rivers and through mountain valleys of the Hindu Kush into the area of ancient Mesopotamia. A couple of millennia-length cold snaps might have slowed progress, but between 54ka and 48ka were 6ky of temperate climate that would have enabled these peoples to expand into the east half of the fertile crescent, and then around the west half of that arc to re-occupy the Levant (which also shows evidence of occupation by modern humans ~40ky previously – see below). The above scenario is compromised by a lack of artifacts from the posited period to document migration across the Arabian Peninsula or southern Iran or into the area of the Hindu Kush. One possible answer is that the main route was through the marshland that now lies under the Arabian Sea and Persian Gulf. Some artifacts have been discovered on the Arabian Peninsula, but they occur mostly well away from coastal regions and are from the Nubian Complex of lithic industries dating from the early part of MIS-5. While some popularized accounts of these findings suggest continuity between these early adventurers and the populations being described within, it seems more likely that climate change stranded and then eliminated these earlier adventurers. Descendant mtDNA haplogroup U coalesced ~55ka from haplogroup R (itself descending from haplogroup N). Haplogroup U perhaps first appeared in NW India in the area of the Indus Valley, contemporaneously with NRY haplogroup F-M89 per our prior hypothesis. Old subclades of mtDNA haplogroup U are found today in the areas of the Indus Valley. NRY haplogroup F-M89 likely coalesced from the CF* population after it had reached NW India. There are no CF* people found in the world today, their descendants being the C-M130 and F-M89 populations. The period from 48ka and 38ka saw this initial population, comprised largely of mtDNA haplogroup U and NRY haplogroup F-M89, expand from the area of the Indus delta through Iran all the way to Europe. It was mostly a temperate time, with four, millennia-length cold periods. Macro-haplogroup IJK-M522 separated from F-M89 perhaps ~45ka in northern Iran. Haplogroup G-M201 separated from F-M89 ~17ka in northern Iran. The descendant haplogroups of NRY IJK-522 would go on to populate the majority of Europe (I1, I2, J1, J2, R1a, R1b, G) and Asia through to the Americas (O, Q). The rest of our story deals with the ancestry of most northern Europeans, a subset of the descendants of IJK-M522. There was a bifurcation of the M522 population ~44ka with the appearance of haplogroups KT-M9 and IJ-M429. Their descendants would meet again in Neolithic Europe, but they are believed to have taken very different routes over the intervening 35k years. Genetic anthropologists deduce the IJ-M429 population moved directly northwest to Europe, where the I-M170 population evolved. That is the path we follow here. The KT-M9 group headed east to central Asia before their R1-M173 descendants again turned west toward Europe. We talk about the M9 group briefly at the end. It seems probable that haplogroup IJ characterizes, in largest part, the peoples who were initially called Cro-Magnon man, the human inhabitants of Europe in the Upper Paleolithic. Today, the term European Early Modern Human (EEMH) is preferred. The claim that EEMH was from haplogroup IJ derives from two observations: descendant haplogroup I-M170 is exclusively European, and there is no other known genetic group with a current descendant who could have been there over 40kya, except Y-DNA Haplogroups F and C; and there many fewer instances of these haplogroups today in Europe compared to Haplogroup I descendants. There are some paleogenomic results that suggest some clades of Haplogroup C may have entered Europe, either with the F populations, or at a later date. Another alternative might be that some genetic group, unknown to us now, comprised the initial paleolithic European inhabitants. If so, perhaps they did not survive the LGM. But there are cultural continuity observations that make such an alternative less likely. More paleogenomic evidence must be uncovered to extend our early knowledge of Europe. The following map demonstrates in blue the residual footprint of the European haplogroup IJ descendants having SNP M-429. Some current IJ* populations have been found in north Iran and Caucasus, but the majority represented here consists of the union of current haplogoups I and J, where most of the non-European M429 people belong to haplogroup J. Indirect evidence for EEMH in Europe dates from >40ka, in the form of tools and other artifacts. The tool culture of the EEMH hunter-gatherer people was Aurignacian, an advancement never achieved by their contemporary Neandertal populations in Europe. The Aurignacian technology is a refinement of earlier technologies brought by our paleolithic ancestors from Africa. Archaeological evidence consisting of fine points with impact damage suggests the early Aurignacian peoples already had the bow and arrow, an additional advantage for them in competing for game. Pictures of bows appear in cave paintings in Europe dating from over 30ka. The Aurignacian tool culture has been authenticated in a broad arc from Iberia to the Don River. It thus bears an exclusive European heritage. There are also Aurignacian findings in the Levant, perhaps due to some back-migration. It is characteristic of a rapid expansion of EEMH across Europe prior to 40kya. The Aurignacian toolkit was succeeded by the Gravettian refinement ~28ka (perhaps corresponding to a sudden warming event just prior to the LGM). The Gravettian technology continued on through the LGM for more than ten millennia. Fine engraving and sculpting techniques produced decorated tools, beads, ivory carvings, clay figurines, and musical instruments. Later Aurignacian toolkits gradually evolved to include nets, bolas, and spear throwers, enabling efficient hunting. Bone and antler tools were added to the basic stone cutting implements. Clothing was of sewn animal pelts and leather, made with bone needles. Such advances were not unique to our IJ peoples or the Aurignacian culture, but appear widely across the Eurasia of the Upper Paleolithic. Such ubiquity of manufactured goods, and the skills to make them, suggests Upper Paleolithic expertise had roots much deeper in our African past. And there is evidence to corroborate that we have been clever creatures for a long time. A South African cave gives evidence of the use of bedding made of plants with medicinal and insect-repellant qualities dating back to 77kya. There is also evidence that the bedding was burned regularly and replaced as a housekeeping function. This find corroborates an intimate knowledge of plants and their human uses dating deep into our collective past. Other evidence from the African Middle Paleolithic suggests the use of traps and snares, and the manufacture of glue for affixing handles to stone implements. The IJ center of coalescence is thought to have been in the area of northern Iran. There is recent excitement due to a 2012 study that reports discovery of a basal IJ* population there (M429+, M170-, M304-). Unfortunately, the study authors seemed uninterested in further characterizing this DNA for new SNPs, and no STR testing was reported. So this important find leaves many questions unanswered. The study reported that 2.3% of Persian ethnicity and 1.4% of Mazandari (Caucasus) were found to be IJ*. The most direct northwest migration scenario has the IJ peoples traveling south of the Caspian and around the coast of the Black Sea to reach the Balkans and the Danubian basin. Their precise route may never be known. But there is a paucity of Aurignacian artifacts south of the Black Sea, and a wealth of artifacts to the north in the Crimea and along the Don. Some of these artifact dates precede 40kya, suggesting a presence during the time of the original migration, rather than a later expansion eastward. During the MIS-3, the Black Sea is thought to have been a large glacial melt lake, somewhat smaller than its current size. Thus there would have been a large margin around the basin that was habitable, which would have presented little resistance to a large migration. Geography doesn’t seem to favor an IJ migration route across Anatolia. With significant mountain ranges hugging the Mediterranean coast and a high central plateau, these areas would not have been a typical habitat of these people. Also, there is little developed Aurignacian evidence from the area. Perhaps further study will suggest a likely route and an amount of time it took. It seems likely most of the evidence lays under the Black Sea, just as earlier evidence may lay under the Persian Gulf. For now, there seems slightly more evidence for passage through the Caucasus and across the north shore of the Black Sea to the lower Danube ~42ka, but the jury remains out. Based on current 2010 archaeology and dating, there is strong evidence documenting the presumptive arrival of these IJ people in the Danube basin by 40ka. Cave art in Spain and southern France has been dated similarly. Open tundra of Europe at this time would have allowed rapid advancement for these cold-adapted hunters, but still these early dates for western Europe surprise, unless Homo neandertalensis developed art in parallel to Homo sapiens, or unless the paintings are representative of a parallel and yet undocumented migration of Homo Sapiens into Europe by boat around or across the Mediterranean from the Levant or North Africa. The climate record shows a sudden warming ~38ka that raised temperatures well off their lows, enabling those with a foothold in the south of Europe to begin advancement northward. There was likely some mixture of Haplogroups F*, and perhaps C, among them. Some of IJ* remained in West Asia (just where they are found today), for Haplogroup J-M304 separated ~30ka and remained mostly in its West Asia homeland, eventually spreading as far as the Balkans and southern Italy in Europe, and also through north Africa. The IJ people left evidence of their early Aurignacian toolkits and some of the earliest examples of figurative art and musical instruments known. In a cave at Hohlefels in the Schwabian Mountains near the headwaters of the Danube and Rhine, there were found the earliest known Venus figurine, the earliest known musical instrument (bone flute, fragments of ivory flutes), a bird carved of ivory, and a small lion-headed figurine, some dating to more than 35ka. The zoomorphic (or anthropomorphic) subject is similar to depictions in some cave paintings in France several millennia later. In nearby Hohlenstein, a larger carved ivory lion-headed figurine was found, dating to ~32ka, showing continuous residence in the Schwabenland for several millennia. Also in Schwabenland at the Vogelherdhöhle, carved ivory figurines of large mammals were found, dating from ~35ka, among them a mammoth, bison, lion, snow leopard, and horse. Venus figurines have been found from the Pyrenees to Siberia, dating from 35+ka to 11ka. Their principal characteristic is exaggeration of female genitalia and secondary sexual characteristics, while simultaneously ignoring facial features and feet. They have not been found in burial sites. Their distribution may be characteristic of and define the range of the IJ people. In the ensuing 30k years, climate permitting, these earliest presumed IJ people spread throughout Europe to the farthest west corners, from the Pyrenees to Britain. There is no remaining IJ* population outside their Middle East homeland to help us trace their routes. Perhaps the ending of Venus figurines mark their demise at the end of the LGM. The early Aurignacian EEMH lived on hilltops and ridges at average distances of ~5km from river tributaries. Karst caves and other rock shelters predominate. They followed the game, the large mammals, so these were probably seasonal shelters. The later Gravettian people adopt gradually more open settlements, some perhaps permanent work bases, found on slopes overlooking river valleys. These sites would be within sight of the rivers, so as to locate and control game moving through the valley. It is a pattern of gradually more sedentist living, as further evidenced by a change in faunal remains to the smaller mammals from the vicinity of the settlements. One sees a continual refinement in EEMH during his European history. While Mesolithic European humans are ~10% more robust than current humans, the earliest IJ humans were ~30% more robust than modern humans, and still presented archaic features. Many times such archaic tendencies were mistakenly considered as evidence of admixture with Neandertal populations, but current mtDNA shows no evidence of residual Neandertal influence. As the capabilities of EEMH advanced, his life became easier, and consequently he gradually lost some of his robustness. There are very few skeletal remains of EEMH from >25ka. A skull, mandible, and other fragmentary remains from a cave in SW Romania at Peştera cu Oase date from 35-40ka and while statistically classifiable as AMH, have some archaic features. The skull is the oldest EEMH skeletal piece known in Europe. Also in Romania, remains of EEMH were found at Peștera Muierii (Romanian for “The Woman’s Cave”). It contains human fossils from 40-30ka. An early EEMH settlement, with tools and remains of multiple individuals, has been found in a cave at Mladeč in the east of the Czech Republic. It dates to 32ka and is tentatively associated with an Aurignacian toolkit, although not many tools were found. Also in the Czech Republic at Předmostí, a settlement was found with associated burial area containing some 20 burials, with 15 complete human interments, dated at up to 27ka. The non-human fossils are mostly mammoth. Many of the bones are heavily charred, indicating they were cooked. Other remains include fox, reindeer, ice-age horse, wolf, bear, wolverine, and hare. At Les Eyzies, Dordogne, France, EEMH remains were found in a rock shelter dated to 28ka, the original ‘Cro-Magnon’ find. The remains indicated these people led a physically difficult life, with healed spine and skull injuries that would have been debilitating, thus indicative of communal support and care of the sick and injured. There are finds of similar age and older from England and Wales as well, but these are not as complete. Dog evolution may have been symbiotic with evolution of EEMH in the paleolithic. Dogs are gray wolves that diverged from their wolf origins perhaps as much as 100ka; the time and selection method are not determined yet, the issue confused by possible dog-wolf admixture during the process, and probable multiple instances of co-evolution. Genetic studies have found four subclades of dog, two of which are closer to the ancestral gray wolf. Domestication of dogs, and perhaps rarely foxes, was probably already practiced before the LGM, although the earliest evidence of inhumation with a dog dates from ~14ka in multiple locales, one instance near Bonn that may be related to the I peoples. Dogs are thought to have been necessary for the early immigrations from Asia to North America by the Q and then the C peoples. From before the LGM, Europe had gradually become hostile to habitation north of the Alps, with the possible exception of the Carpathian Basin. One can conjecture that the pre-LGM peoples were gradually pushed into southern refugia by less and less productive arctic steppe and tundra that transformed their earlier hunting grounds. They probably followed their big game resources south. Being nomadic, perhaps they did not sense the LGM crunch they were experiencing, although their journeys south perhaps would have brought them into conflict with other groups, and human density might have increased in the southern refugia. There was no way to get over the Alps then, so the refuge choices were southeast or southwest. NRY haplogroup I is thought to be the oldest haplogroup with a European origin, long associated by paleontologists with the spread of the Gravettian toolkit. The I-M170 population likely formed an admixture throughout southeastern Europe with the existing parent IJ clade, and so appearing in close association with Venus figurines. Paleogenomic evidence points to mtDNA Haplogroup U5 being prevalent there simultaneously. Evidence further suggests the some portion of the basal Eurasian NRY F and C clades and mtDNA M clade were there as well. The timing and location of the haplogroup I split from IJ has been variously estimated, but with large error bars whose union extends from 15ka to 33ka. The mean value is 24ka, slightly earlier than the Karafet et al. (2008) M170 date, 22ka. Evidence of the Gravettian techno-complex aligns with the earlier range of these possible I-M170 founding dates. Further, Underhill et al. (2007) shows the divergence of the two major subclades of M170 at 28ka. That is the date I consider for the occurrence of M170 in Europe. By the time the ice sheets had reached their maximum advance into Europe ~25ka, the eastern European peoples were probably driven down into the southern Pontic Steppe, Carpathian Basin, and back into the Balkans. The western European peoples were forced down to the Mediterranean coast of France and further west toward the Iberian peninsula. Haplogroup I has two remaining subclades, I1 and I2, both predating the LGM, as I interpret Underhill above. These clades currently share the same geographic range in far northern Europe, but it appears they developed very distinct basal mythologies, suggesting separate LGM refugia with no contact. This is likely the best guess one can make until paleogenomics enlightens us. The following map (Wikipedia) shows the footprint of modern I-M170, with population density gradients indicated. If one were to guess, one might place the I1 refugia around the Western Mediterranean. U5 females and I males are the oldest exclusively European haplogroups. The U5 mutation precedes the I SNP by ~5ky. Referring to the above map, mtDNA haplogroup U5 is expected to have a somewhat wider distribution than that of haplogroup I. The U5 presence extended further south around the Mediterranean coast, across Italy and throughout Iberia as well. The origins of I-M253 (I1) and I-M438 (I2) prior to the LGM seems an open question at this time. Because of the current Balkan concentration of I2, it is a reasonable assumption that I2 populations began there. The I1 origin remains a mystery shrouded in various conjectures. Again, a best guess might be in SW Europe. Linguistics is a magical science in its power to derive schemes relating and distinguishing various language families that on the surface look absolutely dissimilar. Linguistics is thus metaphorically the study of language genetics. Yet the paleolithic provides too few clues for even linguistics to work its magic. The origins of spoken language are beyond our ken, likely dating to the early upper Paleolithic. Written language is much more recent, and may have evolved in part via people marking on the walls of caves. The life of the EEMH would seem to require advanced oral language skills, to communicate from one group to another and from one generation to another their technology, customs and rituals, hunting skills, and warnings (e.g. about poisonous plants or dangerous animals or conditions). There is a debate whether a single proto-human language ever existed; it seems likely to this observer that a proto-human language process existed, but language itself would be different for each group that used the process. The paleolithic cave paintings and some stone carvings may have been the primitive genesis of the human capability for written communication. Some scholars have attempted to provide a ‘Rosetta stone’ for interpreting the markings on these paintings as ritual ideograms, but whether one is convinced or not is probably a function of the observer’s imagination. Much later are found, associated with an early Neolithic Danubian culture, some tablets and pottery with symbolic inscriptions, the Vinča signs. It appears to be a local development and its meaning, whether ritual pictographs or a primitive attempt at written language, may never be known. If it were the genesis of a proto-writing style, they would be far the oldest examples known from Europe. There are other contemporaneous symbol engravings from all over southeastern Europe, with centuries-long continuity of some symbol use evident, leading to a non-mainstream hypothesis that such written symbols comprise fragments of an Old European script. Europe has ended up with one language superfamily, the Indo-European languages, thought to be of Eurasian origin with roots in the Neolithic. Around the fringes are some language isolates that seem structurally quite different (agglutinative and polypersonal). It makes a nice story to presume the IE languages are an overlay on top of another family of languages devised by EEMH, most of which has been lost. Basque, Hungarian, and Georgian are some examples of still existent isolates. Whatever the story, the roots of our complex language grammars likely emerged no earlier than the Mesolithic, with an arc of decreasing complexity reaching back past the LGM. It is unlikely that a proto-language can be reconstructed that resembles such a paleolithic European language. Yet that doesn’t stop linguists from trying. The oldest language for which comparative studies have been pursued is the speculative proto-Nostratic language, projected back to Middle East origins in the Epipaleolithic. And while it is doubtful that this result will resemble a language that was ever spoken, it is an instructive effort that reveals one possible model for such a language. Concerted efforts have been under way for some decades to construct other proto-languages, e.g. the Dené-Caucasian language family, the Vasco-Dené family, etc. These research efforts sometimes offer tantalizing connections, but there are sometimes conflicting hypotheses floating under these generalized language umbrellas, and perhaps too much smoothing away differences. The seeming overreach of such efforts may mask more than it reveals. It seems rational that some process like this occurred over eons to get us talking and eventually writing intelligibly to one another. Underlying any such efforts, there must exist understanding of how humans and language have evolved together. But such understanding has been resistant to materialize; we progress primarily through conjecture. Physiologically, some things are known. The human anatomy of the larynx seems to be an adaptation that trades off eating/drinking efficiency with efficiency in vocalizing sound. We cannot drink and breathe at the same time in the way that other mammals can. The lower position of our larynx in the throat permits a greater variety of vowel sounds to be made. The adaptive advantage of vocalization must have been enough to outweigh any eating/drinking advantage that we gave up (although our bipedalism should have obviated that particular advantage). Our brain evolved a large cortex and adaptations in the basal ganglia/caudate nucleus facilitating fine motor coordination and memory for sequences of motor signals, so that when our voice capabilities had evolved, there was a control mechanism ready to utilize it to our advantage. This was perhaps a case where some general advances in brain development were somewhat co-opted to expand human evolution in a new direction toward language. There seems some agreement that language has a biological behavior and has developed a separate evolutionary path of its own, an evolutionary process symbiotic to our own evolution. For how else does one explain the complex syntaxes that organize the several thousand extant languages. Our paleolithic ancestors could hardly be expected to be linguistic experts involved in great language design projects. As with all instances of complex biological design, natural selection is undoubtedly the head designer in charge. In this sense, elements of a language are examples of Dawkins’ memes, cultural entities whose inheritance mechanism (replicator) is imitation by humans, whose variation results from inaccurate mimicry, and whose selection (fitness) is a measure of the ease of transmission to new human hosts. A distinguishing characteristic of memetic vs. genetic evolution may be the more significant role of drift in the former. Some anthropologists also tie this language fitness back to the human genetic advantage, so that language fitness becomes an advantage for human survival as well as for language self-survival. While accurate, this is simply a restatement of a definition of co-evolution, and unnecessarily complicates our understanding of the language process. Language evolution can be understood as independent of human evolutionary biology. Memes can be considered analogous to human parasites, because they require a human brain to replicate. It is in this same sense that Dawkins refers to religions as viruses of the mind. And so ultimately, if humans who speak a language go away, the language will almost always vanish as well, as so many have already done. There is much debate about memetic inheritance in the abstract that may not be relevant to real issues of human intellect development. Yet when considered in the specific narrow sense of language evolution, there is no other rational theory in sight. The process of language co-evolution with the human brain and larynx may never be completely understood, but we express appreciation to Darwin and Dawkins for a theory that provides us some rational basis for conjecture. The Venus figurines were perhaps fertility charms, their use exemplary of a sensed spiritual connection between human well-being and the fecundity of nature. There are other interpretations as well. Millennia later, some descendants of these same paleolithic European peoples practiced a form of Earth worship called Nerthus, the Mother Earth. Some anthropologists suggest these European paleolithic peoples had egalitarian societies, even with regard to women, perhaps matrilocal. Such a contention seems not likely to be demonstrable, but matrilocal kinship is commonly inferred as a likely stable evolutionary strategy for hunter-gatherer societies. Although some primitive societies in the historical realm are observably matrilocal, the kinship structure in paleolithic Europe is probably not knowable. There is some evidence (cultural and linguistic) that the Eurasian invaders of Europe in later times were patriarchal. Correspondingly, some think matrilocal gatherer societies gradually evolved to patrilocal kinship laws after domestication of animals. Perhaps it was during the later stages of the neolithic transformation that women began to be viewed as chattel, available in trade for livestock, and thus readily separable from their kinship support. Prior to the Bronze age and its introduction of structured, hierarchical societies with specialist trades, there are generally not found specialized weapons for use on other humans, nor are there found in European human remains any evidence of war-like destruction, nor burials with weapons. However, in Africa, associated with a hunter gatherer society from 10kya, there have been found human remains evidencing extreme violence resulting from human conflict. Generalizations about paleolithic societies are likely no more valid than such generalizations about current societies. While European societies may have been largely peaceful, certainly it was not an easy life free of danger. In addition to the harsh, unstable climate and competition for food and mates, there may also have been slavery, ritual sacrifice, and cannibalism. Neighboring tribes may have acted defensively regarding hunting territories. The closer we come to historical times, the more signs of large-scale conflict we find. The extreme violence evident in artifacts of battle involving European peoples attests that in near historical times, they all could deal in extreme brutality. When dealing with outsiders, any kinder and gentler traits of humanity were suppressed in order to survive. It seems that even during the Aurignacian, Europe already had a heterogeneous genetic makeup that was too complex for a clear morphological picture of a people to emerge from the paucity of remains. Their observed robustness is principally a function of their life style. Since DNA technology has only slowly and recently been able to readily isolate and genetically sequence chromosomal genetic material from old bones, anthropologists still characterize the EEMH by skeletal morphology. Phenotypes are useful for understanding the evolutionary process; they identify the species characteristics that are of primary importance to the course of evolution of the species through natural selection. Many papers, however, have relied on phenotype descriptions that combine words such as robust and Cro-Magnon-type and sometimes even round head (vs. long head), particularly when distinguishing paleolithic European hunter-gatherers from later arrivals from the Mediterranean or Eurasia. It was the only discriminating tool they had, but it is not clear whether such science actually moved knowledge in the forward direction. We await the ability to sequence chromosomal material from paleolithic human remains to prove conclusively the genetic paternity of the EEMH populations, and thus convincingly demonstrate one’s derivation from them. Hypothetical direct NRY continuity of present day Europeans back to their paleolithic predecessors may be demonstrable via genetic studies of current populations across Europe. But it’s mostly a faint signal. And the huge problem with using current populations to predict past distributions is the absence of an intervening time scale. Thus we could see a signal, but not know if it corresponds to a population movement a few centuries ago or a few millennia ago. The current signal would look largely the same in either case. Only rarely in certain pockets of population off the main migratory paths of the intervening millennia does a significant proportion of the current population appear to trace back male ancestry to Europe of the Paleolithic. The paleo-ancestors of this European minority are the subject of this story. For a brief introduction to the peoples who make up the majority of the modern Eurasian population, see the final End Note below. Leaving Africa ~65ka, the forward wave of CF-P143 migration continued on to SE Asia. Early in the journey, it became host to NRY haplogroup C ~60ka. Most of the C people went east and then south through and around India into Asia and branched out to become the autochthonous Australians (we know them as the Aboriginals) and Melanesians (who appear to have also spread to Micronesia and Polynesia in their early history). The hypothetical expansion of Haplogroups CF-P143 and C-M130 are shown below. Haplogroup C-M130 and F-M89 may have separated from CF-P143 in the area of southern Pakistan. To explain the 6% Denisovan DNA in Australasians, it is a natural hypothesis that somewhere along the advancing front of NRY C and mtDNA M explorers in oceanic SE Asia, there was encountered a population of Denisovans. Between 50ka and 60ka, there was apparent DNA exchange, at least one way into the C/M population. While I have seen no explicit mention of haplogroups C or M in the relevant literature, these types are the only human lineages to have been there at the time, per current understandings. Around 35ka, the SE Asian NRY C people developed the unique EDAR gene mutation that altered their teeth, hair, mammary, and skin physiology. The EDAR gene plays a fundamental role in the embryonic development of mammals. The phenotype changes due to this mutation are thicker hair, more sweat glands, smaller breasts, and a slight change to configuration of teeth. Current hypotheses suggest a combination of selection pressures for establishing the new phenotypes across the evolving NRY C population, including ability to tolerate heat more easily, as well as sexual selection. Such hypotheses remain conjecture in light of their inhospitality to testing. Regardless, positive selection has occurred, since the C peoples of east Asia became markedly distinguished in physical appearance from the other descendants of the NRY M168 out-of-Africa progenitors. Some 20 millennia later, a subgroup, NRY C3-M217, went north around southeast Asia and produced Mongolians, Kazakhs, and Genghis Khan. They developed a concentration from Mongolia north throughout Siberia. A sub-population, C3b-P39, migrated from Asia to North America after the LGM. These soon-isolated North American C3b peoples became the speakers of the Algonquin, Souixan, and Na-Dene/Athabascan languages (Tlingit, Navajo, Apache). These C3b people migrated across the Asian-American land bridge called Beringia. At its maximum it was 1500km wide. It lasted in various sizes while LGM sea levels were low, likely over 15ky. Beringia was never glaciated. It was steppe/tundra to the north and Pacific NW forest along the south coast. The C3b people were perhaps the last group to migrate from Asia to America before the Bering Strait reopened after the LGM, eliminating the land connection. They were preceded by migrations of NRY Q and R1 peoples into the Americas as discussed below. Some portion of the the YAP+ peoples (the M168+ sister clade to CF-P143) also left Africa ~65ka, heading for East Asia. Had they followed the coast of India as many of the contemporary NRY haplogroup C peoples appear to have done, one would expect some residual population throughout India, which is absent today. There is further evidence that might substantiate a separate route for NRY haplogroup D. The migrating NRY C peoples acquired some genetic material from the Denisovan archaic hominin population along their route, but the Haplogroup D peoples did not. It is possible NRY haplogroup D migrated across northern India via the Indo-Gangetic Plain and then went north into Tibet and also south to the Andaman Islands. When they reached Northeast India, they acquired the M174 SNP and became the NRY haplogroup D people. They eventually reached Japan by ~30ka, where we know them as the autochthonous Ainu. Other small residuals of M174+ occur today throughout central Asia. It is presumed that NRY SNP M174 occurred in Asia, since there is no M174+ population found in Africa nor across most of India. NRY haplogroup D is only found in today’s India in the far northeast and in the Andaman Islands, where it has apparently lived in isolation for perhaps 50ky, occuring almost exclusively in conjunction with mtDNA haplogroup M of similar antiquity. Apparently the YAP+ peoples who brought Haplogroup D to south Asia left no trace of themselves as they navigated across India. The E-M96 peoples originated within the YAP+ peoples of Africa ~52ka. They are mostly found today as a dominant African NRY haplogroup. After being established in Africa for 50 millennia, one subclade, E1b1b-M215, migrated to Eurasia, perhaps around 10-12ka. E1b1b subsequently spread around the European Mediterranean coast, perhaps carried by Neolithic expansion there. Also over time, some small descendant groups of the populations outside of Africa appear to have migrated back to Africa, explaining some unexpected haplogroups there today. 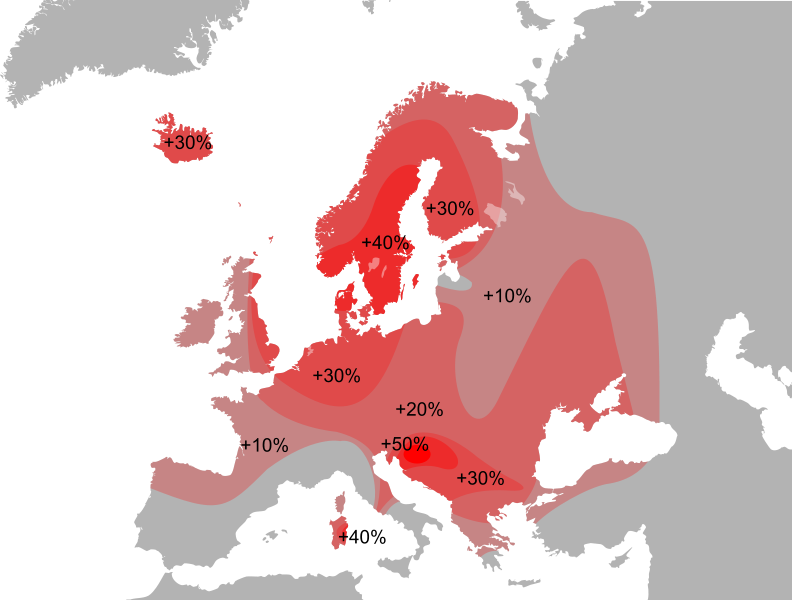 Most of the European population today does not descend from the IJ-M429 clade. Beginning with the Neolithic, there were large migrations from the East (Anatolia, Mesopotamia, the Levant, and the Asian steppe). Of these, the R1 peoples from Anatolia and the steppe dominate the current population DNA. Since this discussion is Eurocentric, some understanding of the routes these peoples took is necessary for completing our picture. Recall the KT-M9 population is a sister clade to IJ-M429 discussed hereto. Briefly, the KT-M9 people are thought to have moved through Iran going east along rivers to the Hindu Kush of central Afghanistan. Over the next several millennia, the macro-haplogroup KMNOPS-M526 people coalesced within the KT-M9 people and pushed further east into Asia, perhaps along the eventual northern route of the Silk Road. 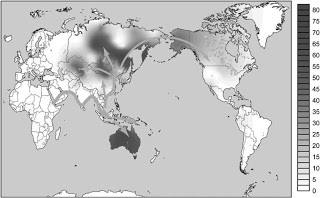 It was here from a central Asian homeland that several sub-populations of M526 peoples isolated and began to migrate away, acquiring the individual clade SNPs that comprise the M526 composite clade. Central Asia thus became homeland to many of the peoples whose descendants would populate most of the world outside of Africa. Haplogroup O separated from KMNOPS-M526 over 30ka. It would spread to SE Asia and as far as Polynesia, overlaying the autochthonous NRY C populations there. Haplogroup K has been discovered in a 45kyo human in Ust’Ishim near Lake Baikal. P-M45 separated from KMNOPS ~34ka and moved back onto the Eurasian Steppe. R-M207 separated from P ~27ka and continued west to the Caspian and Caucasus. R1-M173 separated from R ~19ka. R1b-M343 separated from R1 ~17ka. Haplogroup P-M45 produced another subclade ~20ka, Q-M242, widely spread across Asia and participating in the first migration wave across Beringia and then as far as South America. Thus, Q-M242 is characteristic of the autochthonous Americans. A possible current scenario has the R1-M173 people in central Asia just at the start of the LGM. Some R1 peoples migrated through Siberia, across Beringia, and into America. Their descendants, including the Objibwe/Chippewa, Cherokee, and Seminole peoples, form the second largest autochthanous genetic group in the Americas. The presence of R1 in the North America was originally thought to be admixture with European colonists. Other R1 descendants were the R1a and R1b peoples that emerged at the height of the LGM and found separate refuges. R1a is widely spread. The oldest clades of R1a appear in northwest India, so it appears to have evolved in an R1 population there. Its expansion into its second major locus in eastern Europe may have begun in the Eneolithic. The R1b people perhaps sought refuge south of the Black Sea in Anatolia before expanding across southern Europe, mostly south of the Alps. In 2016, paleogenomic data surfaced placing R1 and perhaps R1b peoples at Villabruna in the north of Italy by 14kya. Their expansion from western Asia likely coincides with post-LGM warming and may have used the Mediterranean Sea routes to the Atlantic. Increasing data point to this expansion period involving some large scale migrations of various peoples into and across Europe. Based on NRY evidence of ancient European skeletal remains, there is at present no indication of R1 subclades in Europe north of the Alps prior to 4500ya, placing the timing of that later western migration near the Eneolithic/Chalcolithic boundary, probably following the earlier Neolithic migration route of haplogroups F and G2 from Anatolia/Caucasus. Perhaps the later R1b land migration rode in on domesticated horse-drawn carts, sponsored by the copper industry, just as the earlier G2 migration advanced on the river of agriculture. Once in Europe, they may have encountered their much earlier brethren who came with the LGM expansion and possibly had populated the Atlantic and Mediterranean coasts of Europe 10ky earlier. The R1b populations became the dominant overlay of Europe, persisting until today. Anyone with European ancestry (aka Euromutts) will likely have autosomal DNA dominated by these R clades, either by R1a (eastern Europe) or R1b (western Europe). Aside: Countering a long-standing pseudo-fact, made widespread by the Internet, that M173+ peoples are paleo-Europeans from over 35ka, European paleogenomics has yet to find a trace of KMNOPS-M526 people west of the Black Sea prior to the post-LGM expansion that repopulated Europe as the ice sheets retreated. The earlier belief perhaps stems from Semino et al. (2000): “… M173 is an ancient Eurasiatic marker that was brought by or arose in the group of Homo sapiens sapiens who entered Europe and diffused from east to west about 40,000 to 35,000 years ago, spreading the Aurignac culture”. Even granting the less sophisticated archaeogenetics at the time, they seemed to make assumptions uncharacteristic of a publication in a peer-reviewed journal. And it never ends. By 2013, this confusion still echoes in journals. NRY haplogroup R was detected from a bone sample from 24ka near Lake Baikal. The reported conclusion of the published article was that NRY R peoples likely had migrated from Western Europe across Siberia into the Americas at the start of the LGM. It was even hypothesized that perhaps R peoples sailed west from Europe across the Atlantic to the Americas. Apparently they didn’t grasp that the R peoples likely had their origins right there in Siberia at the start of the LGM, and their descendants wouldn’t get to Europe for another 10 millenia. Proceed to LGM Refugia: Balkans and Southern France.